We definitely do – the homemade chicken nuggets and slow cooker pot roast from a couple weeks ago are case in point. But when I come across a recipe that my kids ADORE, I can’t help but share it with you. 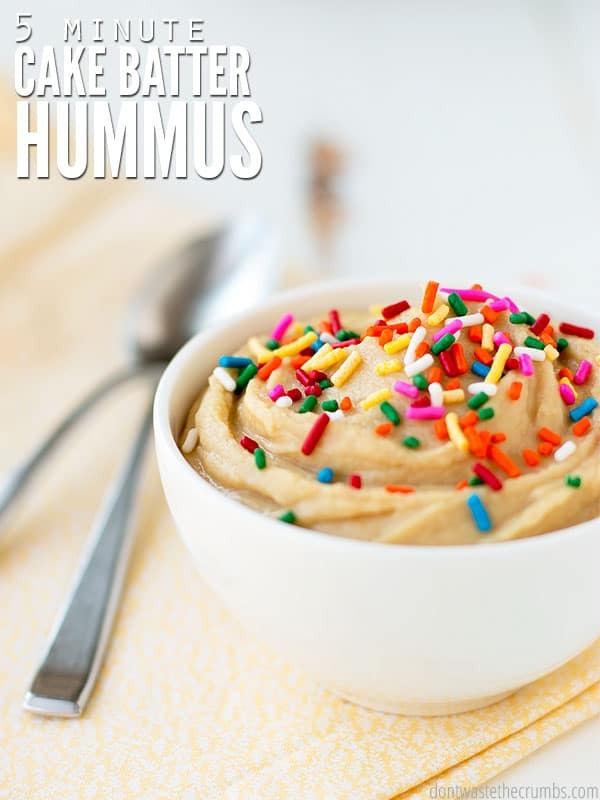 Especially since cake batter hummus is made with BEANS, and the kids keep asking for more! 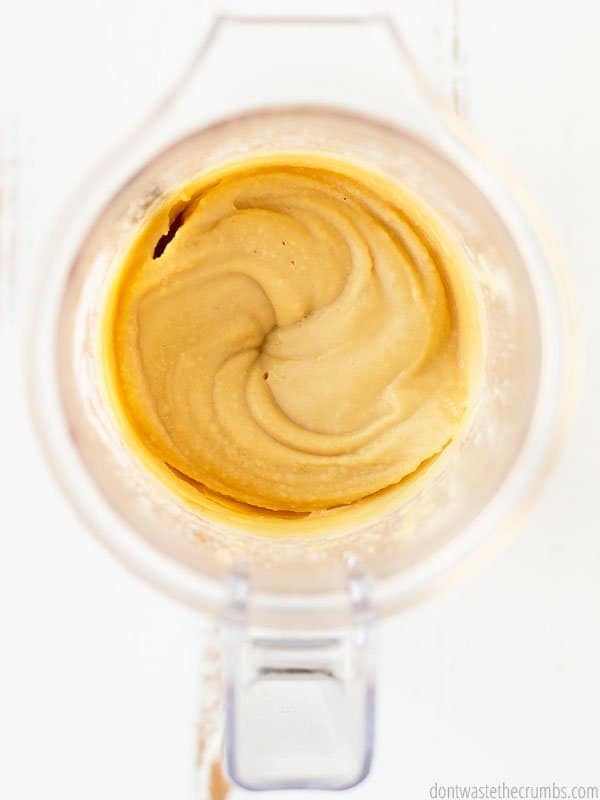 I swear it’s déjà vu from when I first made chocolate hummus, and it’s what spawned me to make this cake batter hummus, snickerdoodle hummus AND cookie dough hummus too! It’s a cycle I’m happy to repeat over and over again. I mean, my kids are ASKING FOR BEANS! What alternate universe am I living in for this to happen?! Shake off the shock friends, because welcome to reality. 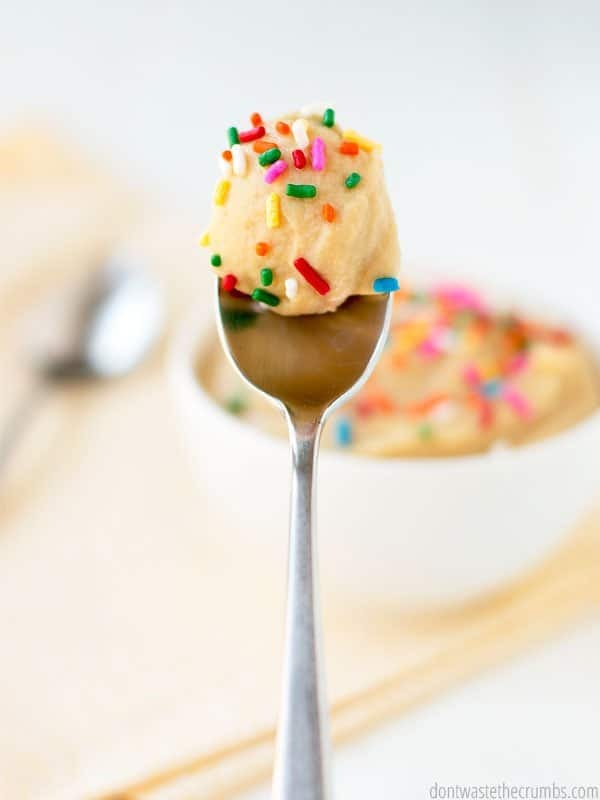 This cake batter hummus tastes like cake batter, is super low in sugar and passed the test for BOTH of my kids (including both Picky Eater and Wannabe Foodie). Plus it’s nut-free and can easily be made gluten-free and dairy-free. And did I mention that it tastes like cake batter? Do you remember being a kid and making cake with your mom or grandma? I do. For me, it always started with opening a box. I used boxes too when my kids were little, but as we quit sugar and make more things from scratch, the cake mixes had to go. But they also were WAY too sweet! As we decrease our sugar intake, we could taste how sweet processed food really is. And while I want to pass on the tradition of licking the spoon to my kids, I couldn’t do it knowing boxed cake was full of ingredients I’m not okay with. I eventually came up with homemade yellow cake mix instead, which is WAY to0 simple to make to ever bother with a box again. Plus it saves money! 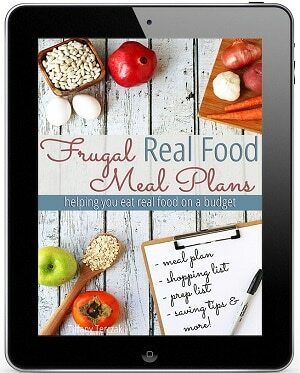 In my course Grocery Budget Bootcamp, I teach you how to evaluate which foods are best for you to make from scratch. That way you’re not wasting your time making things that really don’t help the bottom line. 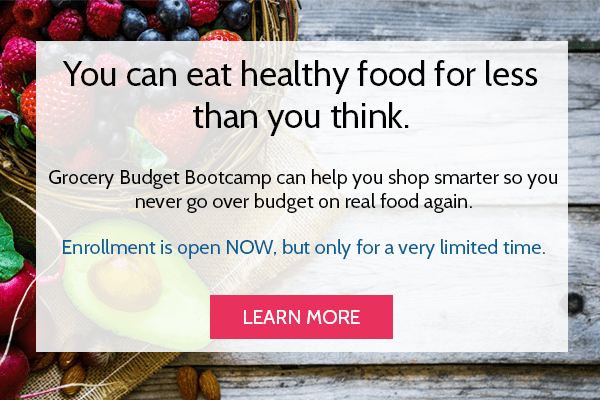 Enrollment is open only 3 times a year, but you can download my free workbook Simple Ways to Save when you sign up for the wait list HERE! 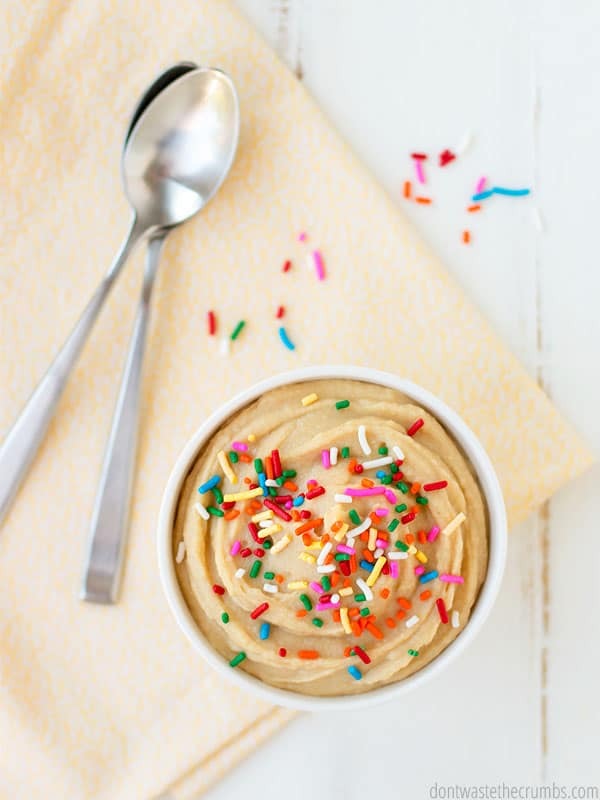 Oddly enough, it’s that jar of homemade yellow cake mix in the pantry that inspires this cake batter hummus! It’s neat how you can start with cake mix, add eggs, butter, vanilla extract and milk and BAM – you get cake. 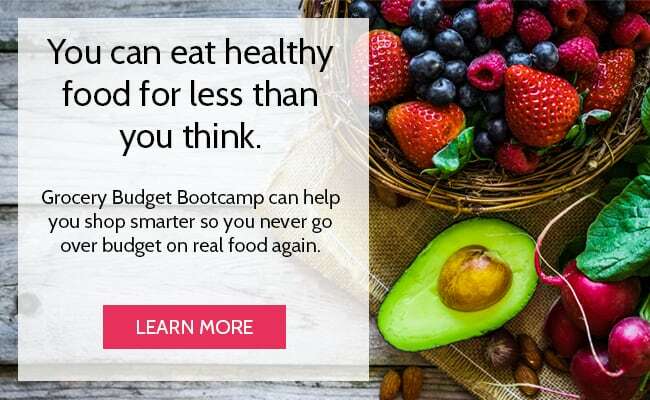 So you’ve got the beans – then add vanilla extract and just a little bit of milk to thin and BAM – you get a DELICIOUS healthy dip that tastes just like cake batter, without excess sugar and without guilt. So I have just one disclaimer here. In my other dessert hummus recipes (chocolate hummus, chocolate chip cookie dough hummus and snickerdoodle hummus), there’s no refined sugar at all. I tried doing the same for this recipe, but the “cake batter” flavor was missing. In the end, 2 tablespoons of organic cane sugar for some of the sweetener and 1 tablespoon of maple syrup was the perfect balance of sweet yet healthy. You can really use any type of granulated you want. Palm sugar would add a bit of caramel flavor. Plain white sugar is the cheapest, but it’s not exactly the healthiest. If you go this route, start with just 1 tablespoon instead of 2. White sugar tends to be sweeter, so you might be able to get away with using less. Brown sugar would be tasty, but like white sugar, start with less. Brown sugar has a bit of molasses, so that’s another level of flavor too. 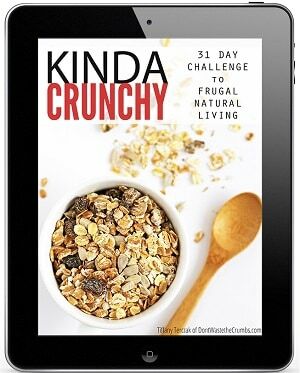 Honey is an option too, but I personally wasn’t a fan of the flavor of honey in this recipe. 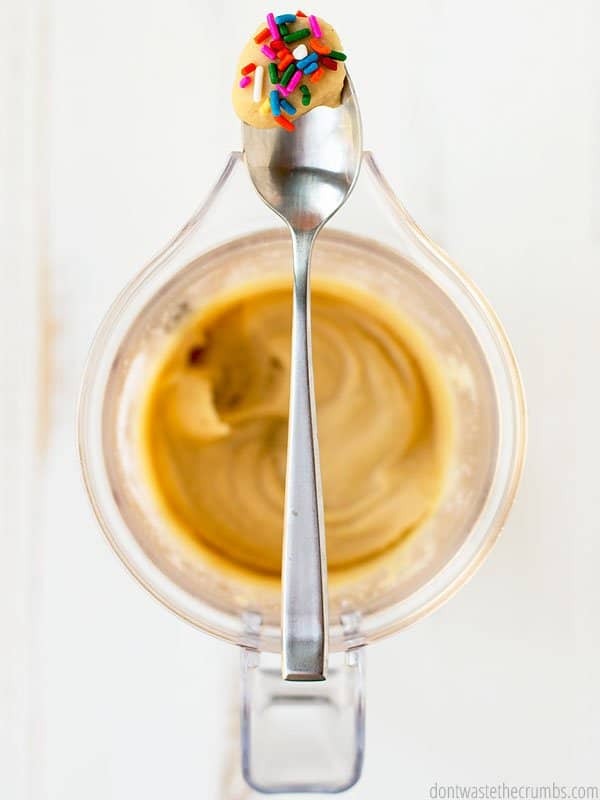 If you’ve made another dessert hummus with honey and liked it, then you’d probably like it in this one. 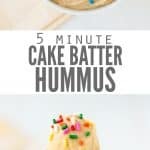 My kids like to eat cake batter hummus with a spoon, but it would be great with a plate of cut fresh fruit or homemade crackers! 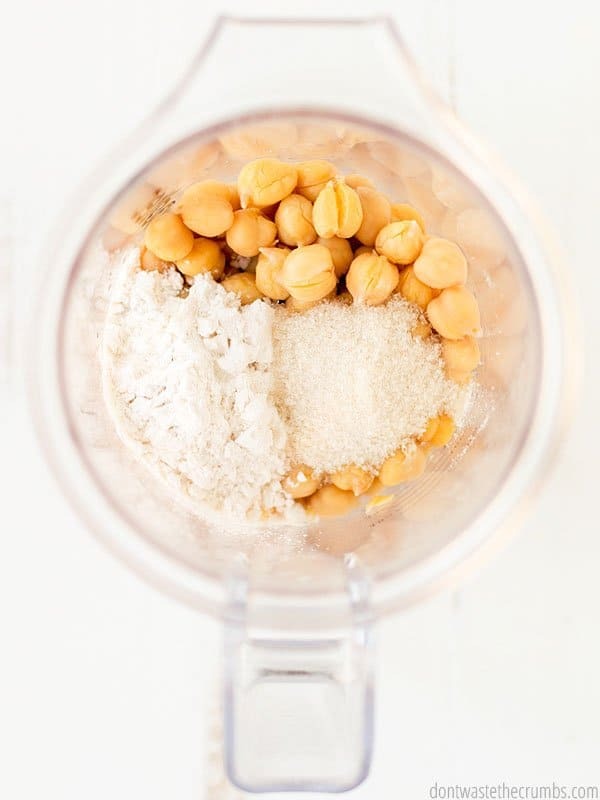 In a blender or in a food processor, combine all the ingredients except milk. Puree until the mixture is smooth, about 30-60 seconds. Add milk 1 Tbsp at a time to create the desired consistency. Taste and add salt (if desired). Adorn with sprinkles, if desired, for serving. What’s your stance on letting the kids lick the spoons? Share your thoughts in the comments below! Your hummus recipes are always so good. In fact one of the reasons I come to this blog is that your recipes are always spot on. I’ve never had a recipe from you that has failed. I have been meaning to ask you though; any chance you’re working on a chocolate cake mix recipe for a future blog? 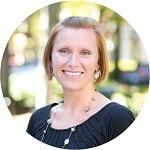 Hi JoAnn – thanks so much for the compliment! I do take my recipes seriously – it’s always a bummer to try one with high hopes, only to have it fail. I aim to never do that! I added peanut butter powder to this recipe. I dip apples in it and, to me, it tastes like a taffy apple. Yum! That’s a great addition! So glad your daughter liked it Albert! 1½ cups cooked garbanzo beans OR 1 15-16 oz can cooked garbanzo beans, drained and rinsed 3 times¼ cup flour (I used all-purpose)2 Tbsp sugar (I used organic cane sugar)1 Tbsp maple syrup1 Tbsp vanilla extract (how to make homemade vanilla)¼ tsp baking powder⅛ tsp salt (optional – omit if you’re using beans that are salted, but taste at the end and add if desired)1-2 Tbsp milksprinkles (optional, for serving). Hi Lija! The recipe is inspired by my homemade cake mix recipe, but I didn’t actually make the cake mix and then use it in this recipe – does that make sense? I actually started by quartering the original recipe, and then modifying from there. If you follow the recipe as written though, I assure you it will taste like cake batter! I would suggest updating your recipe to toast the flour first. Eating raw flour is a leading cause of bacterial-related illness. Many folks think raw cookie dough or batter is harmful only because of the raw egg, when in fact raw flour is just as, perhaps even more risky. I have many farmer friends who are the first to say that they would never eat raw grains or flour because they are not handled or treated to be eaten raw. All grains and flour (and legumes, beans, etc.) need to be cooked before being consumed. Here is another article plus the method for toasting flour (i.e., cooking it) to make safe cookie dough, etc. Thank you, Kate, for this comment, I was hoping someone would have a suggestion because I did not want to eat raw flour. Thank you, Tiffany, for the recipe too! Do you think using coconut flour or rice flour or almond flour would be ok instead of all-purpose? Trying to limit how much gluten I have. Not sure which of the above would be better to use for flavor purposes. I think any would work, but for flavor wise, I’d go with coconut or almond flour the first time. If you can’t taste the coconut or almond, then try rice the second time (b/c I believe rice flour is cheaper, correct?). Hello! What do you normally dip with this? I am wanting to make some as a test for my Daughter’s first birthday. I think this is a great alternative to some dips. We like fruit (apples, strawberries), but pretzels are fun too! Ok, I have to ask . 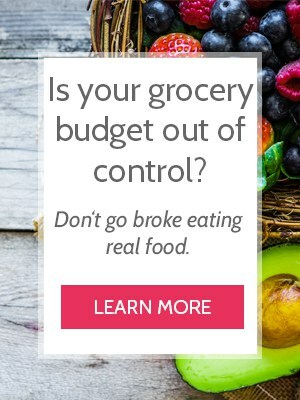 . . baking powder in a recipe that isn’t baked? Why is that? Anyway, dessert hummus is such an awesomely versatile idea, particularly for vegan dessert applications. Thanks for the intro! Purely for flavor Patricia! We tested with and without, and without won! What do you dip in this? I made and it tastes delicious but we can’t figure out what flavor would compliment it best. What do you suggest? We usually use a spoon. 😉 If you need something to dip, fresh fruit works, as does pretzels or graham crackers!